Neuralcur is a homeopathic tincture in a 100 ml dropper bottle of SIMICUR for oral use in dogs, cats, horses and ponies. Application: The attached lining ensures Neuralcur for optimal metabolism, creating a healthy development and maintenance is ensured by nerves. Neuralcur has a regulating effect on the central and peripheral nervous system and has a regenerationsfördende effect on nerves. Neuralcur be applied in traumatic nerve disorders, lameness symptoms and symptoms of ataxia. Effect: Damage to nerves caused by trauma, lead to paralysis or ataxia. 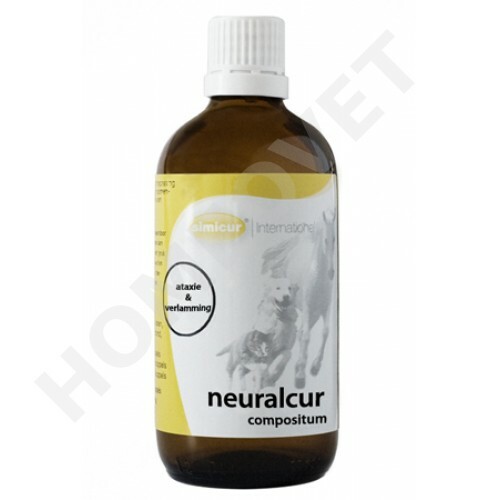 The nervenregenrierende effect of Hypericum, in combination with the anti defensive and healing properties of Arnica and Ruta makes Neuralcur extremely useful for the treatment of nerve damage. Neuralcur added to the feed results in an optimum activity in both the central nervous system (brain and spinal cord) or the peripheral nervous system (nerve).